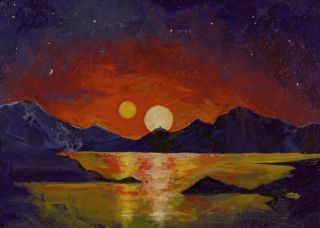 An acrylic painting by University of Utah astrophysicist Ben Bromley shows a sunset on a planet orbiting two stars. Pluto and its moons may serve as an analogue to these types of planetary systems. In recent years, planetary scientists have begun to suggest that Pluto and its moons might have something in common with the fictional planet Tatooine — the home of Luke Skywalker in the "Star Wars" movies. Pluto and its largest moon, Charon, orbit each other in a way that is similar to binary star systems, or two stars that orbit close together. On Tatooine, this arrangement led to gorgeous dual sunsets. But how would rocky, habitable planets form in such a strange environment? Pluto and Charon might provide scientists with an answer. In 1977, the movie "Star Wars" was released in theatres and featured what would eventually become one of the most iconic sunsets in movie history: a desert landscape topped by a purple and red sky featuring two glowing suns (the illusion was created by overlaying two different shots of the sun). When young Luke Skywalker looked longingly at that beautiful skyscape, he seemed to be wondering whether he would ever leave his desert home and find adventure. It's likely that many planetary scientists had the same longing in their eyes when staring at that sunscape, wondering if they would find evidence of such planets existing in the real world. Fifteen years later, scientists caught sight of the first evidence of planets around other stars. Today, a handful of gas giants have been spotted orbiting two suns, but no rocky, terrestrial planets that might host life as we know it. "There's a long-standing argument about how difficult it is to make planets around binary star systems," Kenyon said. "There has been a myth that binary stars exert a torque on material [around the stars] that would prevent planets from forming." But a recent paper authored by Kenyon and his frequent collaborator, Ben Bromley, shows that this isn't the case. Their computer simulations indicate that rocky planets can form just as easily around binary stars as around single stars. Real-world examples of planets orbiting binary stars are too far away for scientists to study in detail. That's why a binary system in our own solar system would be a helpful learning tool. This image show s the arrangement of Pluto and its five moons. "It's relatively recent, connecting Pluto to binary star systems," Kenyon said "Sort of a new realization among a few of us." In this way, Pluto and Charon are more like a binary star system than most moon-planet systems. "We are trying to make the connection between how planetary systems formed and how the pieces of the Pluto system formed," Kenyon said. The "pieces" are Pluto's four smaller moons: the most distant moon, Hydra, was discovered in 2005 along with Nix. Kerberos, which lies between Nix and Hydra, was discovered in 2011. Styx, the inner-most moon, which is thought to be less than 15 miles (24 kilometers) across, was discovered in 2012. If early Charon and early Pluto collided, some debris would remain in orbit, but some would be ejected. Pluto's four moon siblings live in an extremely tight orbit around their parent bodies, and Kenyon noted in a recent article in the journal Nature that how such tightly packed systems form is "an open question." Insight into the formation of the Pluto family might come from science data taken by the New Horizons probe, which is only a few days away from its close encounter with Pluto. A close view of the shape of the moons could help scientists determine exactly how they formed. "The question is, did the satellites form in a disk of material, or are they just fragments?" Kenyon said. "It could be a little bit of both. All four of them could be fragments, and then you would expect them to have jagged edges. Or they could have formed by aggregating fragments of a collision — like dust bunnies under your bed." (The latter case would make the satellites more round, Kenyon added). When New Horizons flies by Pluto next week, it should give scientists a better look at the shape of the four satellites. "The Pluto system doesn't tell us much about how Earth and Venus formed," Kenyon said. "But if we do discover Tatooines — Earth-like terrestrial planets around binary stars — then Pluto will help us understand those."